Is Richard Fry still around ? The guy was a star. 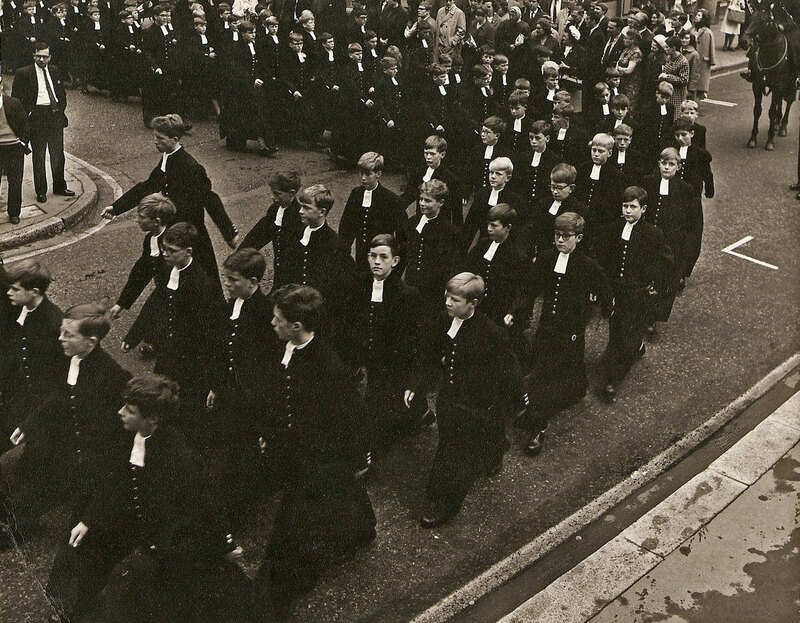 Thanks to Julian please see below a Maine A photograph from Michaelmas Term 1966 as part of the whole school marching to Westminster Abbey for a service to commemorate the 900th anniversary of the Battle of Hastings. As an aside I'm pretty sure at least some of the Hertford girls also were in attendance as I seem to remember seeing them marching with their blazers and boaters. 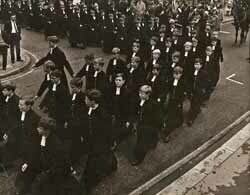 Mid A 15 wrote: Thanks to Julian please see below a Maine A photograph from Michaelmas Term 1966 as part of the whole school marching to Westminster Abbey for a service to commemorate the 900th anniversary of the Battle of Hastings. We wore Panamas not boaters, I don't think there is anyone on here who would have been in the sixth Form at that time and gone. I know we didn't all go. I come from "1066 Country" and HM the Queen and HRH Prince Philip made a visit at the time and met all the youth organisations. At the time I was a St john's ambulance cadet and have a photo of me from the local paper qwith the queen walking past. 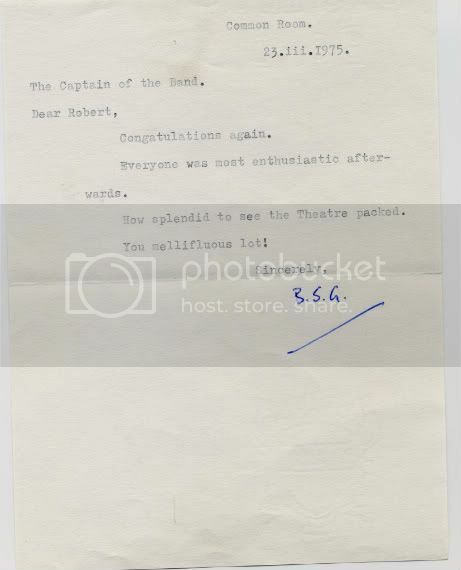 Prince Philip spoke to my cousin ( a Wolf cub as they were known then) who didn't have the foggiest who he was, but did have the presence of mind (and manners) to add 'sir' to his answer. Crawshaw(me), Simpson, McCleod, Underwood, Timberlake, Hibbs, Goodwin, Dinsmore, Bell, Butler. A few of the question marks. 2nd row from back: "Egg" could be Heartfield. Heartfield in my year was known as "Egg" and I believe he had a younger brother. Tattersall is next to "Egg." Roger ? was Bysouth I believe. 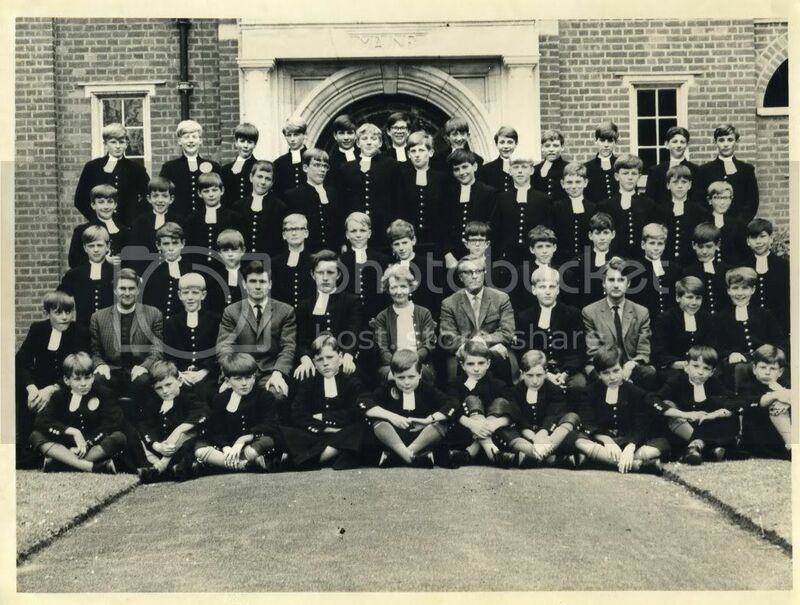 3rd row from back: Not sure on this one but vaguely remember a guy called Southgate in Maine A could it be him? 2nd row from front: James Houghton is the guy next to Rev Hall-Matthews. I think "Reed" was actually "Read" but yes it is the metalwork teacher. Not B.S.Gregory, who used to teach Latin in the Prep Houses in the early 60's, perchance ? J.R. wrote: Not B.S.Gregory, who used to teach Latin in the Prep Houses in the early 60's, perchance ? Yes, I confirm all of those including Southgate, it was Robertson not Robinson. If you asked me I would have said that "Egg" Heartfield was the younger of 2 Heartfields at CH but I am not sure. My memory has been jogged and there were definitely two Heartfields. The elder "Egg" (Philip) was in my year and can be seen in the photo of Maine A marching to Westminster Abbey in the Michaelmas term of 1966, kindly posted by Julian on my behalf, higher up the thread. He is next to Bob Pilbeam and in front of John Crisp. I know time takes it's toll, and as a new 63 year old, I speak with experience, but BSG doesn't look as half as scary as I remember him in Latin classes in January 1958 ! Hard but fair is how I will always remember BSG. He was undeniably fond of wielding a gymshoe to a backside but it was invariably deserved, certainly in my case and I speak as one who received quite a few whacks, and he never bore a grudge. Once you were punished that was it - forgotten. One of my CH related regrets is that I returned to see friends still there in the year or so after leaving. I looked for BSG whilst there but was unable to find him and didn't bother to try a second time later. He died suddenly not long after so I never did see him again. Incidentally I think BSG was 44 when the photo above was taken in 1969. How do I know that you may (or may not) ask! The answer is that the Free BMD (births, marriages and deaths) website shows the birth of a Basil S Gregory registered in the December quarter of 1924.